As a child in western Iowa, Frank Tenney Johnson saw the wagons crossing the land near his home as streams of people headed west in the late 1800s and knew that he would travel west someday as well. After studying art and working as an illustrator in Milwaukee and New York, he was hired by Field and Stream magazine in 1904 to travel and illustrate the life of the cattlemen in Colorado and New Mexico. 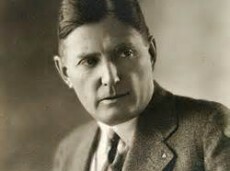 Johnson made several more trips west and became famous for illustrating the Western novels of Zane Grey, which he worked on for fifteen years. In 1920, Johnson bought a house in Alhambra, CA, and then split his time between the New York and California art scenes, joining several art clubs and organizations. It was at this time that his paintings gained more prominence, and he no longer needed to illustrate articles and books to survive as an artist. Although he lived on the east and west coasts, Johnson continued to travel into the West and Southwest sketching and photographing in order to create complete compositions back in his studios. Johnson was most influenced by his early instructors, John H. Twachtman, William Merritt Chase, and Robert Henri, who were all known for their excellent draftsmanship, painterly brushwork, and a fascination for outdoor light. He appropriated elements from the Munich style and American and French Impressionism, but incorporated those features to form his own romantic realistic style. Often he is associated with Frederic Remington and Charles Russell because of their concentration on the trail and the range. However, Johnson is best known for his nocturnal scenes in which he concentrated on the effects of moonlight on form and color.